When journalist Tina Traster visited a Siberian orphanage in 2003 to adopt a baby girl, she wondered if she and her baby would bond, but she dismissed her unease. 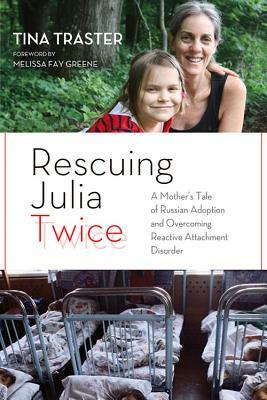 Julia, at eight months (an almost unheard-of young age for Russian adoptees), was healthy and beautiful. Like many of us who adopt after infertility, Traster and her husband, Ricky Tannenbaum, felt lucky; their journey was defined by an optimistic, almost willfully naïve frame of mind. Fueled by hope, they traveled to Siberia in the middle of winter on a plane with duct-taped windows. And while they were lucky in many ways, Traster's searingly honest, articulate memoir narrates her growing awareness of signs that her daughter suffered from Reactive Attachment Disorder, or RAD, a serious behavioral and developmental response to early neglect or trauma. We received a grainy video of a baby being coaxed to smile and crawl for the camera. She wore a diaper. She had the palest skin I’d ever seen and eyes as dark as a tree hollow. She was a piece of merchandise for sale, an object held before the camera to be marketed. I cried hard—for her abandonment, my disappointments, the way circumstance unites a mother and child. Traster translates RAD for a general audience, explaining that when an early primary relationship is disrupted through abuse or neglect (or another reason, such as a prolonged hospital stay), emotional health can fail to take root. Children can become intensely controlling, with extreme acting out, and yet they can be delightful to strangers. Traster thought she was the only one having trouble with Julia until husband Ricky experienced difficulties, as did a nanny, who spoke of Julia having a “wall” around her. It’s painful to watch Julia wage a daily battle against rest and relaxation. When I put her down in the crib after lunch, she immediately springs back up and sways back and forth with a crazed look in her eyes. I try to stroke her head or sing to her, but it agitates her. She won’t look at me. Eventually I leave her in place to fight it out with herself, and after fifteen to twenty minutes or so, she does succumb, but only because she’s out-of-her-head tired. A clinician might call this “hypervigilance,” one "of the signs of RAD, but how much better to have Traster’s bird’s-eye-view description. This is a rare kind of book, one that is both highly readable and awareness-raising for those—like family members, teachers, and counselors—touched by a misunderstood disorder. The idea of a mother engaged in acts of rescue reverberates, seamlessly tying life themes together. Propelled into creating a healthy family system, the author acknowledges the grief of infertility and also rescues her relationship with her own mother. The family renovates—rescues—a beautiful farmhouse. No less important is Traster's rehabilitation of her self-concept as a mother of a child with challenges. Nothing was easy at first, though. Traster felt crushing rejection as Julia morphed from a preternaturally self-reliant baby into an inordinately high-energy, oppositional toddler: “She won’t clutch a hand; she refuses to stay close. . . . At this age, most children will stretch their wings to a point, but they retract when they instinctively know they’ve crossed an invisible line. Julia doesn’t do this.” Instead, at one memorable point, she ran towards a parking lot, willfully ignoring her parents’ cries. Exasperated, Ricky stuck out a foot to trip her. A bystander excoriated him. Their world remained isolated until Julia was four and having problems in school. That’s when Traster and her husband connected the dots and read up on attachment. Among other things, they encountered a sobering online list of murders of twelve Russian adopted children by their American parents. Without excusing these murders, Traster conjectures about the role RAD might have played: “An adoptive parent with no prior knowledge of this down-the-rabbit-hole world doesn’t understand how a baby can be so disturbed. A mother figures enough love and time will fix the problem.” Traster’s willingness to confront these cases helps draw back the curtain of shame and denial. As our culture has become more aware of other developmental disorders such as autism and ADHD, RAD remains poorly understood, and the risks of misunderstanding have serious consequences. Russia put a halt to adoptions by Americans in 2013, in part responding to the murders Traster read about. Recently, Reuters exposed the horrifying practice of “re-homing” children, in which children deemed too troubled for their adoptive parents have been traded like goods online. Some doctors and parents dismiss attachment disorder, claiming it’s rare. One only has to glance at child welfare statistics to see that risk factors are pervasive. Rescuing Julia Twice opens the way for a more public discussion by vividly depicting what it's like to parent when a disorder challenges the very heart of the parent-child relationship.